When you think of soul warming, what kind of food do you think of? When it’s a cool crisp day and the leaves are blowing around and your nice warm and snug in a bug wrapped in a blanket on the couch, what do you like to be sipping on? Snacking on? Devouring? 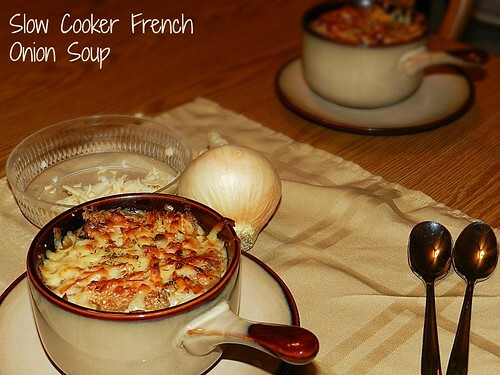 I didn’t have a fireplace growing up but I’m hoping some day in our future house we can sit by the fire and sip on our favorite Soul warming food……..French Onion Soup! It’s funny because my husband doesn’t even like onions. 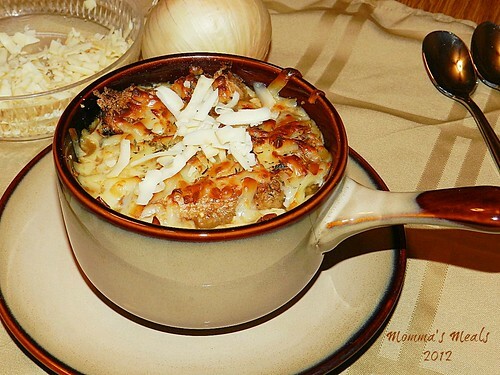 Actually when I first started eating French Onion Soup years ago I didn’t like onions either, but the taste of the broth, the cheese melted on top of the mushy bread that has sunk into the soup is enough to make me eat a big ol’ bowl of it! Over the years the broth was so good I even started eating the onions because I always just want more! Yes I even eat the burnt cheese that pours over the edge of the bowl. 🙂 That’s how good it is. I’ve made a few different versions, crock pot style and stove top style, this time I wanted to try it in the crock pot again so I found a new recipe to try. It was perfect for the evening we ate it on. So thank you Susan from The Girl in the Little Red Kitchen, for hosting this awesome soul warming event!! Gruyere works best. For the top of each bowl. 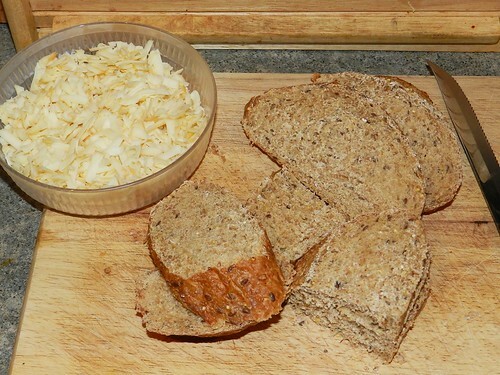 I tried Gruyere for the first time because I knew this was “the cheese” to make with French Onion soup, I’ve always used Swiss because I can buy it in reduced fat and I try to be healthier, this time I went all in and honestly……….we both prefer the swiss! We missed the stringy, wrap around your spoon kind of cheese! Turn the crockpot to high. Add onions, garlic, sugar, butter and balsamic vinegar. 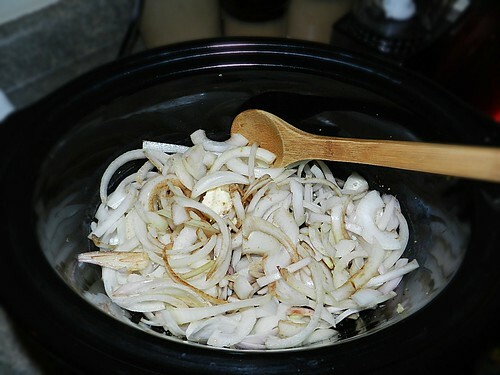 Cover, and let cook for at least two hours, stirring on occasion to brown the onions. After one hour add the flour, beer, stock, thyme and salt and pepper. Reduce heat to low and cook for 8 hours. If the soup was still hot, place the bowls under the broiler for 4 – 5 minutes, keeping as close eye. 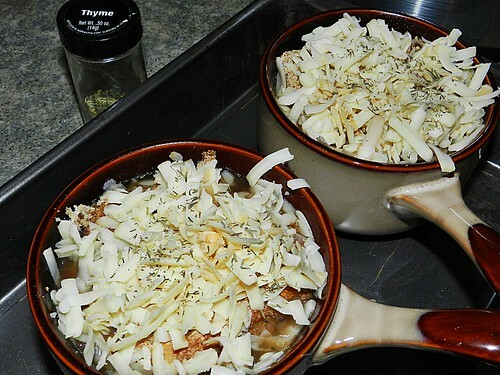 If the soup was cold, place in a 350 degree oven for15 minutes and then finish under the broiler until cheese melts. I even sprinkled some Thyme on top! Then you get this awesome, soul warming, comforting dish to dive into. Let’s see what the other kinds of foods warms my foodie friends soul! wow does that look good! I actually have some in the freezer that a friend brought over. I may need to break it out now!